Our Adopt-a-Pet program is perfect for animal lovers! The highlight of many visits to the Nature Centre is spending some quality time with one of our amazing animals. Adopt one or more of our pets and your donation will help to purchase food, tank supplies and veterinary care for our pets for one month. Tax receipts will be issued for donations of $15 and up. Houdini our charismatic turtle is always a crowd favourite. Named after the magician, Houdini has been known to escape! You will often find him basking on his rock, or swimming around his tank. 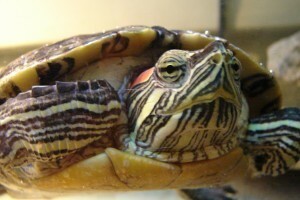 He loves to eat seaweed and his special turtle pellets, which are full of fish, plants, and vitamins. Don’t let the name fool you, Snappy is as friendly as they come! Her name is actually short for snapdragon, a flower that is as red as she is. Snappy also has a checkered tummy, perfect for camouflaging in corn fields. In the Nature Centre she loves to curl up in her birch bark, or around your arms, as she is a constrictor! Though he is related to the eastern garter snake you can find in High Park, you can distinguish Snake from native snakes by his checkered pattern. 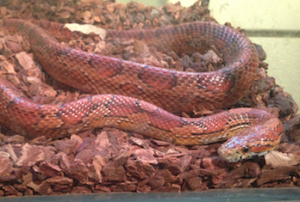 Snake is a bit more shy than big sister Snappy, but is just as friendly! 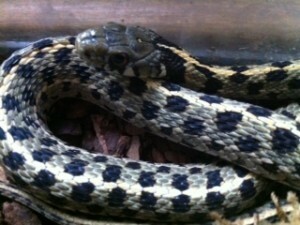 Snake is carnivorous, and likes to eat baby mice called pinkies.